Tokyo Trip – Tokyo Trains 東京の電車 | Japaneze Jusu!!! ようこそ!!! It has been said that Tokyo’s trains are fast, reliable and convenient right?? Well this isn’t a rumour or hearsay!!! Before I went to Japan, I was thinking about whether or not this story is true but it wasn’t until I embarked on Tokyo’s trains that I realised that they are in fact fast, reliable and convenient! ! 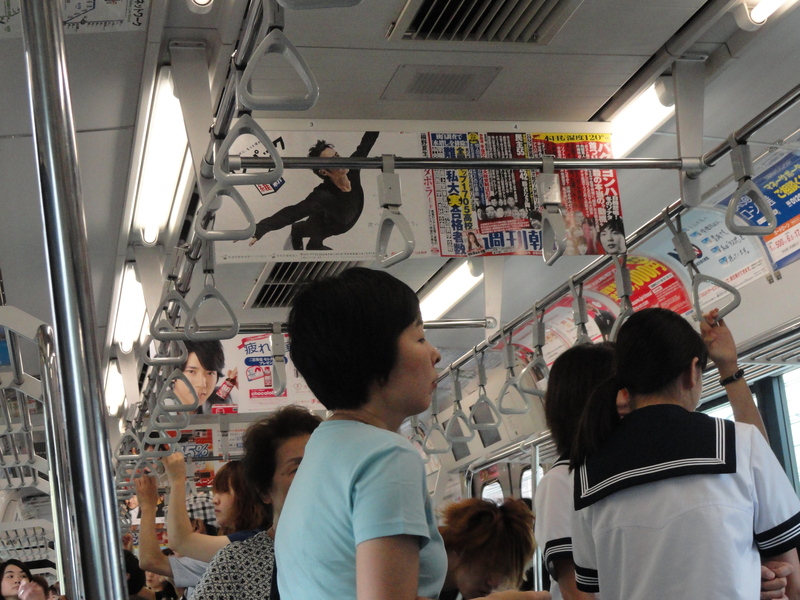 Tokyo’s trains are spacious, clean and there are a lot of seats! Ah, there was also air conditioning!! You’re probably wondering as to why I am excited over this kind of small thing but because it was summer when I went to Japan, the air conditioning saved me!!! lol At that time, because Tokyo was super hot and humid, I strongly thought that I was melting!!! That is why I liked being on the trains! haha! Air conditioning…thank you!!! haha! You were like a life saver! haha! Anyway, there were a lot of adverts suspended from the trains ceilings. Actually, in relation to this picture, when I looked at the ads, it was like I couldn’t see anything but advertisements about Arashi!! No matter where I looked I simply saw these kinds of ads! It was this which I thought was interesting. If you don’t know Arashi, they are a Japanese group! They are really popular amongst Japan’s youth! Finally, while you sit down on the trains seats, you can stare at the different ads and at the same time appreciate the variety!